Ringworm is a fungal infection that inhabits the dead cells that form on the surface of the skin. Ringworm can affect all domestic animals, and humans, and pathogenic fungi that cause the disease are found worldwide. Although "The Merck Veterinary Manual" asserts that ringworm is less common in goats than other domesticated species, the University of Arkansas Cooperative Extension Service cites increasing incidence of ringworm, especially in show goats that may share facilities with other animals where the infection can easily spread. According to "The Merck Veterinary Manual," most ringworm infections in goats go away on their own, so treatment focuses on preventing the spread of infection on the individual goat and to other animals. Captan is typically applied to crops to treat the outbreak of fungal infections, but "The Merck Veterinary Manual" recommends it for treating ringworm in goats as well. Wash the goat daily with one part Captan per 300 parts water and continue this treatment for five days, then continue the treatment weekly until symptoms disappear. Using Merck's recommended dosage, the Arkansas Cooperative Extension Service formulates 3 tsp. Captan per gallon of water. The goat's equipment and housing should also be washed to prevent reinfection. 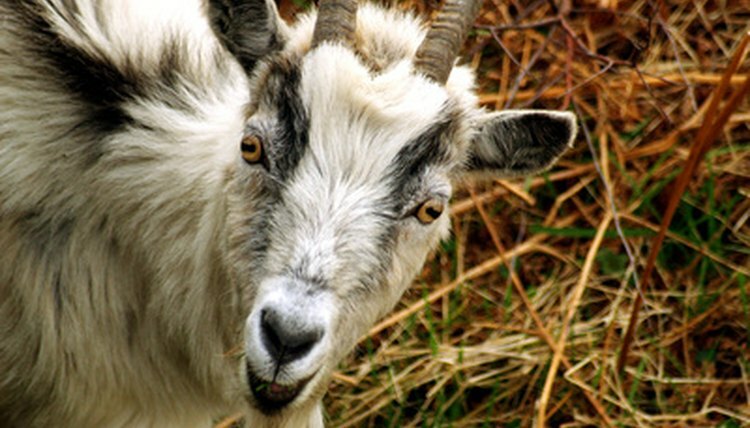 Chlorine bleach can be used in a similar management to control ringworm in goats. "The Merck Veterinary Manual" prescribes a dosage of one part bleach to 10 parts water, which is used to wash or spray the goat, its equipment and its housing. As with Captan, the manual recommends daily washing for five days, then weekly applications until lesions disappear. Your veterinarian may also prescribe a topical fungicide to treat ringworm in your goat. "The Merck Veterinary Manual" recommends thiabendazole in dimethyl sulfoxide. She will prescribe a diluted solution of this fungicide, which you will use to soak the ringworm lesions on your goat's skin. Like Captan, thiabendazole has other agricultural uses for treating fungal diseases in food crops, as well as other parasitic diseases in livestock. Meat goat breeders at the Onion Creek Ranch recommend treating ringworm by cleaning the affected area carefully with betadine surgical scrub or another topical disinfectant. After washing the area carefully, dry it thoroughly and apply 1 percent clotrimazole cream, an over-the-counter medication often used for treating ringworm and related infections. The ranch reminds goat owners to always wear disposable gloves when treating animals infected with ringworm because the infection is easily passed to humans. Treatment takes up to one month to work.